I’m Canadian. Like, grandparents-are-from-Nova-Scotia Canadian. That being said, I don’t mess with boring poutine! This poutine recipe is a delicious, healthy alternative to the OG dairy version. Scrub and wash potatoes to remove any dirt, then peel. Cut length-wise into long, thin strips. Toss in 2 tbsp extra-virgin olive oil, sea salt and black pepper. Line a baking pan with aluminium foil or parchment paper smothered in olive oil to prevent burning and sticking. Lay fries out in an even layer on baking pan. Bake in oven for around 35 minutes, flipping every 10 minutes or so. Heat EVOO in large skillet over medium-high heat. Add onion and saute for 3 minutes until browned. Add sage, garlic, mushrooms, almond milk, nutritional yeast, salt and pepper. Cook until mushrooms are browned, stirring regularly. Add vegetable stock and vegan butter-style spread, lower heat to simmer. Once most liquid has evaporated, add vegetable stock and brown rice flour. Stir occasionally and cook for an additional few minutes. For thicker gravy, feel free to add additional flour by the tbsp. Reduce heat to low simmer, stirring occasionally, to keep gravy warm. Remove fries from oven and wait to slightly cool. Plate the fries, take a handful of vegan “cheese” and sprinkle it on top, then pour the hot gravy over everything. Serve hot! Makes approximately 2 servings. These parfaits were perfect! I’m good friends with Jenn McNaughton, fashion blogger extraordinaire. Seriously though, check out her work at ethcsofstyl.com. Jenn recently interviewed me for the Ryersonian, and we discussed how the Human Rights Commission of Ontario has legally recognized veganism as an ideology with protection against discrimination. I headed over to Jenn’s apartment last Saturday, equipped with groceries and a hearty appetite, to whip up these treats for Jenn to photograph to accompany the article. Whisk together almond milk, maple syrup and vanilla in large bowl or plastic storage container. When ready to serve, scoop chia pudding into mason jars by the tbsp. Layer with fresh fruit and coconut flakes, or simply add after as toppings. Matcha’s recent hype is well deserved! It detoxifies the body, boosts metabolism, calms the mind, lower blood sugar, prevent against diseases, lower cholesterol, and is rich in dietary fibre and antioxidants. 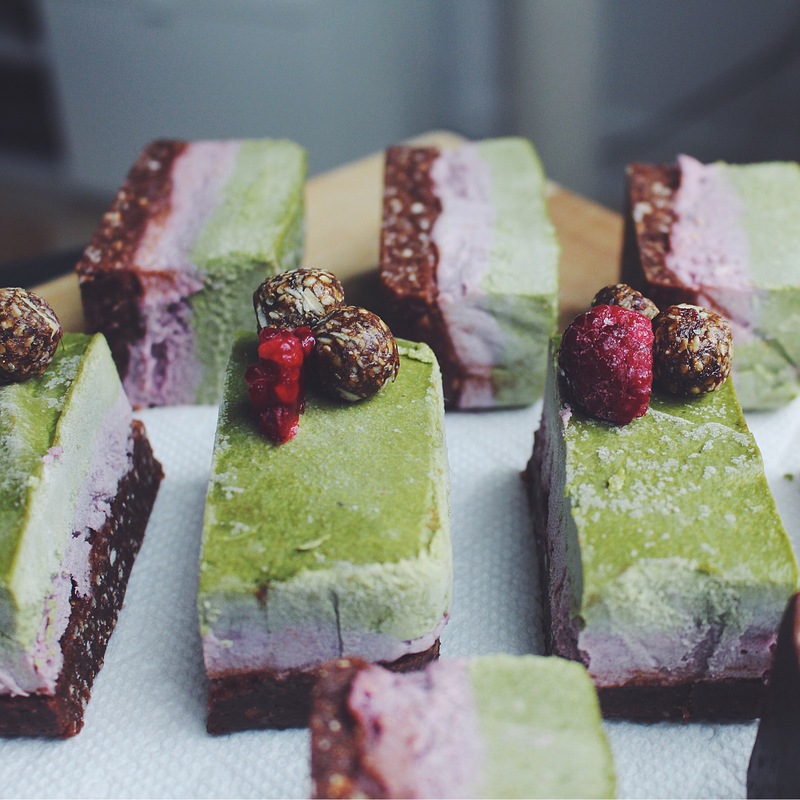 I whipped up a batch of raw treats with matcha cream, raspberry “cheesecake” filling and a chocolate cookie base. Keep reading for the recipe! For the base: blend the almonds, cacao powder, shredded coconut, and dates until the pieces are finely ground and everything is thoroughly combined. Press and flatten this mixture into the bottom of the pan. Set aside in freezer. For the raspberry “cheesecake” filling: blend half of the soaked cashews with half the can of coconut milk, half of the maple syrup, and the raspberries until smooth. Pour, then spread the cheesecake layer out evenly on top of the chocolate base. Place back in freezer to allow layer to set. For the matcha layer: blend the remainder of the cashews with the matcha powder, as well as the remaining coconut milk and maple syrup, until smooth. Pour and flatten mixture overtop of the set raspberry layer. Allow this to set in the freezer for 1-2 hours or even overnight before slicing. Thaw in fridge at least 1 hour before slicing. Cut NRG bar into small bite-size chunks. You can either use a rolling pin to flatten the bar then roll into balls (as seen in photo), or use as is. 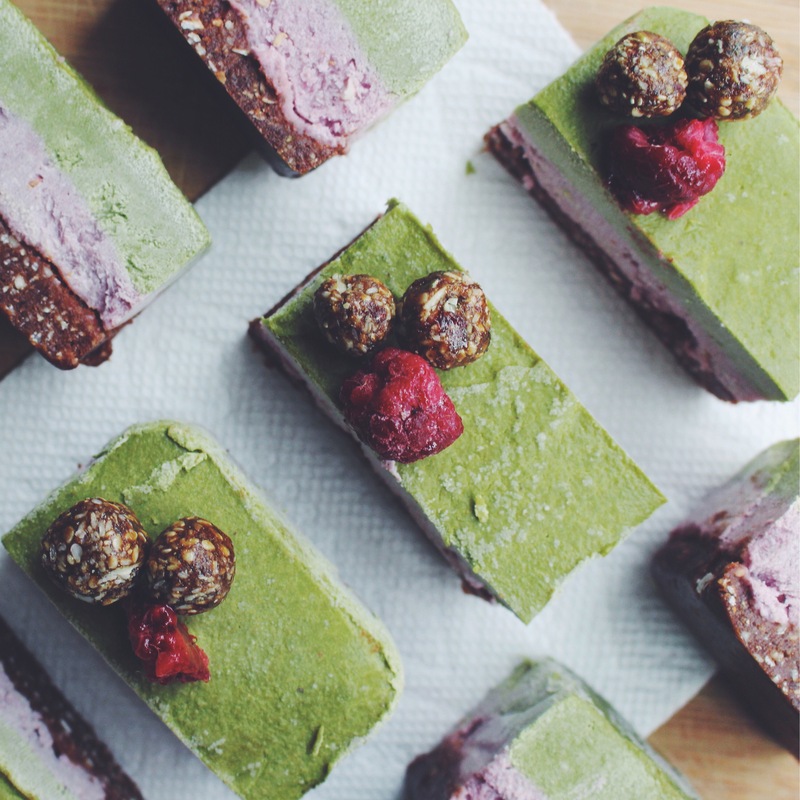 Top each cheesecake slice with a few NRG chunks and frozen raspberries. Serve chilled. Makes approximately 10-12 slices.